Due Diligence on Dube and what’s next for Russell? What can Halifax Mooseheads fans expect from Saturday’s 12th overall pick, Samuel Dube? There have been many questions tossed around about the young player that was just added to the organization’s depth chart over the weekend at the QMJHL Entry Draft held in Shawinigan. Most fans were not aware of the name simply because he was a late addition to the league’s draft eligibility list and because he played on the other side of the planet for EC Salzburg in Austria. The Canadian scouting services didn’t offer much information on him because they weren’t watching him. Dube is not considered a European because he has Canadian citizenship. He was born in Bad Tolz, Germany while his father Yanick Dube was playing professionally in the city. Yanick hails from Gaspe, QC and had a prominent career in the QMJHL in the early 1990’s which included a 141-point season for the Laval Titan where he scored 66 goals and added 75 assists in 1993-94 alone. The son of the former QMJHL star has been on the radar of Mooseheads General Manager Cam Russell for quite some time. Finding hidden gems has certainly been a calling card for Russell over the past several years which to me leaves no reason to doubt the process. The GM was able to watch Samuel Dube first-hand while on a European scouting trip and said he knew that he would make an excellent addition to the team that will host the Memorial Cup in 2019. Competition will be tight at training camp with very few spots available on the veteran team looking to win the franchise’s second Memorial Cup championship of the decade. Although comparisons to Xavier Parent have been made, Russell said that doesn’t mean anything. Dube was an offensive star for his team last season and was a driving force in helping Salzburg win the 16-team league championship. He scored 32 points in 12 games, equalling a ridiculous 2.67 points per game and then added another 13 points in eight games. His playoff point total was fourth-best in the league (EBJL) and second on his team. Russell didn’t hold back when talking about his skills with the puck. As every hockey fan knows, smaller players have been able to have more of an impact in the game in recent years yet still the knock on the 2002-born player will be his size. He isn’t very big at the moment, standing 5-foot-7 and tipping the scales at 143 pounds but there have been no signs of that hindering Dube as he prepares to make the step to the next level. He is not afraid to go to any area of the ice and has shown a great ability to back-check and contribute on the defensive end. That will be music to the ears of newly appointed Head Coach Eric Veilleux who is known to expect maximum efforts from his players. The Mooseheads new bench boss has some familiarity with the Dube family as he played with Yanick Dube on the Laval Titan for two seasons under Head Coach Bob Hartley. Another teammate of theirs in Laval? Mooseheads Goaltending Coach Eric Raymond. The team scouting staff are all very high on the Mooseheads second round pick, defenceman Cole Larkin of the Charlottetown Pride. He’s a player they have seen many times and feel his stock will continue to rise. With Halifax’s defense basically set for the Memorial Cup season, it’s likely we won’t see much of Larkin until 2019-2020 but another year in Midget will give his body and skills time to further develop before he makes the leap to the Q. His size is a bonus at 6-foot-1 and 185 pounds and the Moose scouts raved about his intelligence on the ice. I spoke to scout Hal Davidson who said Larkin’s ceiling is high and he has no doubt this kid will be a key player in years to come. One of my favourite stories from Saturday’s draft has to be the selection of Membertou’s Sonny Kabatay who was taken 80th overall by the Herd. He comes across as a confident and mature young man. He was a big-time producer with the Cape Breton Tradesman last season with 42 points in 34 games but I think more importantly the Moose were able to pick up a quality individual. Moments after I spoke to Sonny on the draft floor, Head Atlantic Scout Allie MacDonald pulled me aside to mention an email he received from Kabatay’s School Principal which was a glowing report from the school faculty about his work ethic in the classroom and his the caring way he treats his peers. Apparently Sonny took it upon himself to help a fellow student with significant intellectual challenges find his way to all of his classes in September. The Principal called Sonny a remarkable young man that demonstrated a level of maturity and empathy you don’t often see in a grade nine student. Sounds like the type of player every organization would love to have in it’s system. Here’s a look at one of his goals for Team Nova Scotia at the Gatorade Frost Challenge in Blainville-Boisbriand. Now we wait for the other dominos to fall. It’s anyone’s guess where Mooseheads superstar Filip Zadina will be picked later this month in the NHL Entry Draft and what his new team will have planned for him. Another lingering question mark is the future of Otto Somppi. He would not only fill a European roster spot but also one of the three overage positions as a 1998-birth. 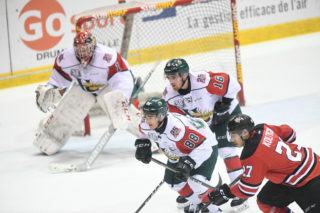 We could see both, one or neither back in a Mooseheads uniform given the circumstances. Russell has the ability to make two picks and has stated that he will do exactly that during the CHL Import Draft which is only a few days after the NHL Entry Draft. If Somppi does not return that will leave recently acquired Jordan Maher and returning defenceman Jake Ryczek as locks for 20-year-old overage spots, but who will fill the third? Who will be Alex Gravel’s goalie partner? Those are definitely two of the main questions being pondered by arm-chair GM’s like myself along with the only person whose opinion even matters in the situation, Cam Russell. 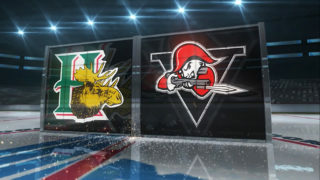 Two teams to watch out for next season will definitely be the Drummondville Voltigeurs and Baie-Comeau Drakkar. 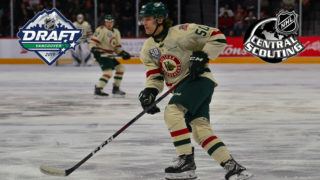 Both continued to get better through trades this past weekend as the highly skilled Volts officially added sniper Maxime Comtois from Victoriaville in what of course was another poorly kept secret around the league. Drummondville and Victo also hooked up for a deal that sent a 2020 1st -round pick to the Tigres for overager Felix Lauzon. Add those two players to a forward group that includes names like Veleno, Lynch, Guay, Simoneau, Mercer, Koltygin and Desruisseaux and you have a very, very deep offensively talented team. They could stand to add something on the blueline but the Voltigeurs are in great shape to take a run at the President Cup. Baie-Comeau is another interesting team. 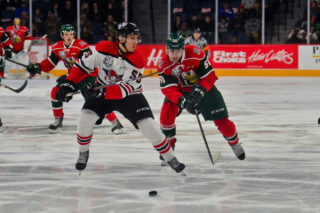 I think the addition of 20-year-old Samuel L’Italien was a great pick-up and one that kind of flew under the radar with all of the other big names being unloaded by Acadie-Bathurst. The Drakkar also picked up Samuel’s little brother Dylan from Sherbrooke for a 9th-round pick which makes for a cool storyline if nothing else. The Baie-Comeau defence corps was bolstered by big Andrew Smith who came over from the Tigres for a mere 10th-round pick. He’ll fight for an overage spot on the team and at 6-foot-7 and 225 pounds, is one of the most intimidating figures on the back end in this league. They shored up their goaltending by dumping the inconsistent Francis Leclerc off to Moncton and adding Kyle Jessiman from Cape Breton. 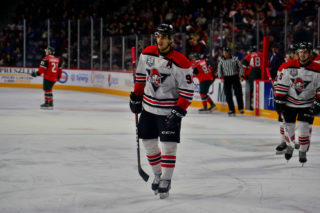 Jessiman certainly has plenty left to prove himself but it’s an upgrade in my opinion especially after watching Leclerc so closely in the first round of the playoffs against the Mooseheads. The Drakkar were also able to pick up two-time 20 goal scorer Yaroslav Alexeyev from Sherbrooke. The 19-year-old Russian will slot in nicely in a top-six forward role while filling a Euro slot. 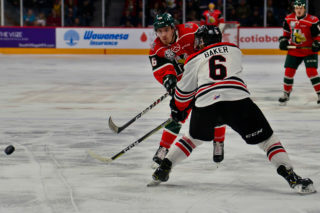 Cape Breton was another team that was busy retooling on the weekend with big additions of hometown overager Mitchell Balmas and a solid defenceman in Antoine Crete-Belzile. As previously mentioned, they moved out Kyle Jessiman, paving the way for Kevin Mandolese to become their official number-one goalie in what will be his third season in the league. GM Marc-Andre Dumont also added a backup goalie from Rimouski by sending draft picks to the Oceanic for 2001-born William Grimard.